‘He got tired…He gotta sit down’ says Jack the Aboriginal guide of Henry Alberdine, who sat down by the rock known to the indigenous people as Yad Yaddin. Henry was disillusioned by what he had made of his life: he’d abandoned a secure future with a cotton mill in Lancashire to take up the futile pursuit of a non-existent butterfly in Australia. So he sat down in the sand one day and didn’t budge – creating a legend, a family tree and a town. Young women found him romantic, so he sired descendants as gloomy as he was – and his passive protest against life became the name of a town as, over time, ‘Sitdown Rock’ was corrupted into ‘Siddon Rock’. Odd? Henry Alberdine is only one of a quirky cast of characters who inhabit this irresistible story. There are so many of them that Glenda Guest has provided a family tree at the beginning of the book, but this is no family saga. Faintly reminiscent of Rosalie Ham’s The Dressmaker in the way that it subverts stereotypical ideas about rural towns, Siddon Rock had this reader hooked from the very first lines – which introduce Macha Connor shrugging off her army uniform and striding through the town stark naked. It’s the women who are the strong characters in this town, and it’s Eliza’s demand that George Alberdine make good his proposal with a decent house for her to live in that sends him off out into the outback to find one. Bizarre? Yes, but in Glenda Guest’s hands the bizarre is convincing, even when George comes back from his venture with 39 houses behind him and an ominous pact with a Faustian character to boot. Guest blends the supernatural with mundane reality so that it seems plausible and the mundane seems fantastic and important. Like the mysterious mistral in Joanne Harris’s magic realism novel Chocolat, a dust storm billows through the town shifting the landscape but departs without a trace. Salt, a recurring motif, behaves in curious ways, and the sounds of the bush are hushed when momentous events occur. Strangers materialise out of nowhere, flesh becomes mist (p194), business accounts have a life of their own ‘as if they just don’t want to be the same as each other’ (p211) and blue notes are visible around a music lover. All the characters have secrets or hidden lives, and meeting them in the pages of this book rouses an intense curiosity. If like most writers Glenda Guest has drawn on her own life experience to write this book, she must have met some fascinating people indeed! From the agoraphobic Reverend Siggy Butow to Catalan who can’t leave her old place behind, these characters exerted a spell that kept me reading well into the night. The landscape is integral to the story as if it were a character too, for the Australian landscape is imbued with ancient mystery and supernatural powers. 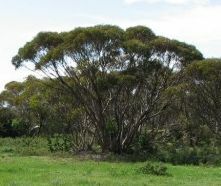 (I’ve included this picture of a mallee tree for international readers who may be bemused by the ‘low growing mallee … nothing like any … in England or Europe’ (p196). The Mallee, both a place and a tree with indestructible roots, always reminds me of my mother saying that ‘if an artist painted a tree like that, you’d think he’d made it up’.) The story is framed around a return, an arrival and a disappearance from a place called Siddon Rock, but it’s the ancient name of Yad Yaddin which orchestrates this tale. Siddon Rock won the 2010 Commonwealth Writers prize for the Best First Book, and was long-listed for the Miles Franklin. It’s a mystery to me why it didn’t make the shortlist – it’s a truly innovative book that’s a real pleasure to read. There’s a terrific review on Glenda Guest’s site by Richard Bilkey, one at the Courier Mail,and an article by Miriam Cosic about the author in The Australian. PS The cover design is by Sandy Cull, gogoGingko, and it was Highly Commended in the Best Designed General Illustrated Book category of the APA (Australian Publishers Association) Book Design Awards. John, at Musings of a Literary Dilettante has posted a review too. Oooh, and to think I was going to ask you whether magic realism was still alive in Australian literature! Thanks Lisa – this looks right up my street and will go straight to the top of the TBR. Cheers, jb@LD. Oh, Sue! Of course, how could I have? I forgot about you and your love of trees *chuckle* There are so many nifty allusions in this book, and Mallee trees are only one of the author’s apt choices. As all Aussies know, Mallee roots were heart-breakers for the early settlers because they were indestructible and made clearing the land impossible. In Siddon Rock, one of the messages is that the untamed landscape will have its way. Book groups would have a wonderful time with this book! I live in the UK and have been looking to buy this book – without success. Can anyone recommend a website that sells it? Or indeed any other alternatives for someone who decided to sitdown in London!!! You can buy Siddon Rock through Amazon now, or as an e-book. A great read.